(Nanowerk News) The SPEDOC project will create the precursor to future devices for individualized diagnosis and monitoring of cancer therapy, which will allow the illness to be treated in earlier stages and at lower doses, reducing or preventing current secondary effects. Physicists and oncologists from Spain, France and Switzerland have joined efforts on a project to develop a novel ultra sensitive platform for early cancer detection. The project-called SPEDOC (Surface Plasmon Early Detection of Circulation Heat Shock Proteins)-is coordinated by Professor Romain Quidant, from the Institute of Photonic Sciences (ICFO), affiliated with the Universitat Politècnica de Catalunya (UPC). Quidant is a researcher contracted through a Catalan Government program at the Catalan Institution for Advanced Research and Studies (ICREA). 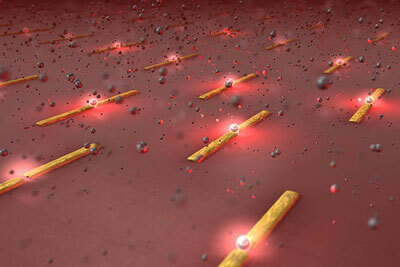 Optical sensors based on plasmons serve as tweezers to capture cancerous cells. The SPEDOC project, which was recently begun and is expected to produce the first prototype in three years, combines the latest advances in nano-optics, optical manipulation and microfluidics (science dealing with the development of devices allowing liquid flow through microscopic channels) with recent discoveries on the HSP70 protein. According to these discoveries, both the capacity to generate tumors and metastasis potential, along with resistance to chemotherapy are associated with the increased concentration of HSP70 in cancer cells. By the same token, cancer causes an increased HSP70 protein concentration in peripheral blood, cell membranes and cancer cells. The researchers intend to design a compact device integrated into a small platform allowing for a portable lab that would be used in a biological laboratory environment by doctors and operators not specialized in optical technology. This mini laboratory could be a precursor for future individualized diagnostic devices. By the same token, early detection of cancer will foster the development of new therapies that will be applied to the patient earlier and at lower doses, with the consequent diminishment of harmful secondary effects. The primary factors required to develop this innovative device are greater knowledge about the HSP70 protein and the development of optic sensor technology using what is known as the plasmon effect. This effect is based on certain nanoparticle characteristics of various metals, as, for instance, gold, which makes them act as highly efficient miniature (nanometric-scale) light and heat sources. The portable laboratory will contain various types of sensors based on these plasmons. The sensors will allow doctors to measure HSP70 protein concentration in both the blood and cell walls. The latter measurement is particularly important because it can indicate the potential presence of the highly dangerous migratory cancer cells, usually very difficult to detect and responsible for spreading cancer from a controlled body area to a non-controlled one, generating metastasis there. In addition, the system for measuring HSP70 protein concentration in cell walls employs the plasmon effect in the form of plasmonic tweezers to capture cells and subject them to optical examination without harming them. Researchers believe that both technologies could provide a sensitivity ten times higher than current cancer-specific marker detection. Increased sensitivity in marker detection will contribute not only to early detection of cancer, but also to greater efficiency in monitoring its treatment, since deciding that a patient is cured depends on the sensitivity of the technology employed. The application of treatment would also improve, both in conventional and newer therapies, because doses could be administered in earlier stages and in lower quantities. These new therapies, also being studied at ICFO by ICREA Professor Romain Quidant's group, are based on recognition molecules inserted in gold nanoparticles. The nanoparticles travel under the guidance of the recognition molecules until they reach cancerous cells, which are then eliminated via laser technology, once again using the plasmon effect of gold nanoparticles. In addition to ICFO, three universities and one corporation are participating in the project financed by the European Commission's 7th Framework Programme. These are the University of Bourgogne; the National Institute of Health and Medical Research (Institut National de la Santé et de la Recherche Médicale) of Dijon; the Federal Polytechnic School (École Polytechnique Fédérale) of Lausanne and COSINGO-Imagini Optic Spain S.L. Cancer continues to be a serious disease in Europe. Although the specific cancer incidence by age group remains more or less stable, the total number of cases is slowly rising, primarily due to the ageing of the population. This trend will continue over the next few years, since by 2015 it is estimated that the population over 65 years of age will increase by 22%. One out of every three men and one out of every four women are likely to get cancer. According to data from the Spanish Association against Cancer, the incidence in Spain is 162,000 cases per year.